Figure 1. 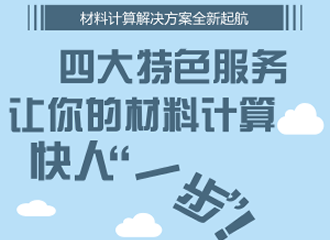 Analysis of O-vacancy defects on the reduced Co3O4 nanosheets. (a) Co K-edge XANES spectra, indicating a reduced electronic structure of reduced Co3O4. (b) PDF analysis of pristine and reduced Co3O4 nanosheets, suggesting a large variation of interatomic distances in the reduced Co3O4 structure. 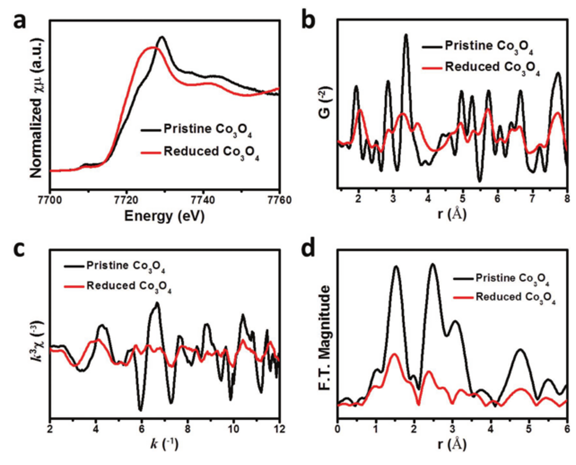 (c) Co K-edge EXAFS data and (d) the corresponding k3-weighted Fourier-transformed data of pristine and reduced Co3O4 nanosheets, demonstrating that O-vacancies have led to a defect-rich structure and lowered the local coordination numbers. Fig. 2 In-situ XRD analysis of the interactions during cycling. （a）XRD intensity heat map from 4 o to 8.5o of a 2.4 mg cm–2 cell’s first cycle discharge at 54 mA g–1 and charge at 187.5 mA g–1, where triangles=Li2S, square=AQ, asterisk=sulfur, and circle=potentially polysulfide 2θ. 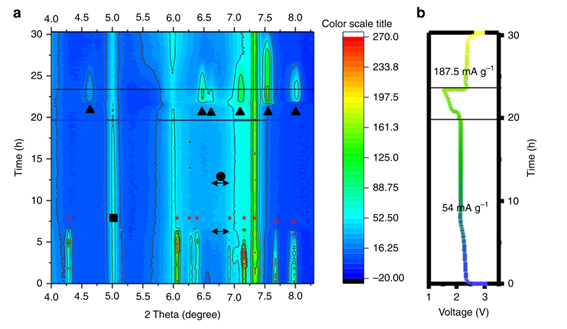 (b) The corresponding voltage profile during the in situ XRD cycling experiment. Fig. 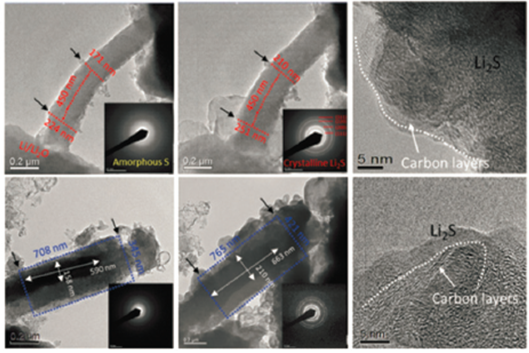 3 Collected in-situ TEM images and corresponding SAED patterns with PCNF/A550/S, which presents the initial state, full lithiation state and high resolution TEM images of lithiated PCNF/A550/S and PCNF/A750/S. Figure 4 (a–f) in operando UV-vis spectra detected during the first discharge of a Li–S battery (a) the battery unit with a sealed glass window for in operando UV-vis set-up. (b) Photographs of six different catholyte solutions; (c) the collected discharge voltages were used for the in situ UV-vis mode; (d) the corresponding UV-vis spectra first-order derivative curves of different stoichiometric compounds; the corresponding UV-vis spectra first-order derivative curves of (e) rGO/S and (f) GSH/S electrodes at C/3, respectively. Fig. 5 Ab initio calculations of the redox mechanism of Li2Mn2/3Nb1/3O2F. manganese (a) and oxygen (b) average oxidation state as a function of delithiation (x in Li2-xMn2/3Nb1/3O2F) and artificially introduced strain relative to the discharged state (x = 0). c, Change in the average oxidation state of Mn atoms that are coordinated by three or more fluorine atoms and those coordinated by two or fewer fluorine atoms. d, Change in the average oxidation state of O atoms with three, four and five Li nearest neighbours in the fully lithiated state (x = 0). The data in c and d were collected from model structures without strain and are representative of trends seen at all levels of strain. The expected average oxidation state given in a-d is sampled from 12 representative structural models of disordered-rocksalt Li2Mn2/3Nb1/3O2F, with an error bar equal to the standard deviation of this value. e, A schematic band structure of Li2Mn2/3Nb1/3O2F.